Nigel Boston grew up in England and obtained degrees in Mathematics from Cambridge and Harvard. His postdoctoral work in Paris and Berkeley was followed by 12 years at the University of Illinois, except for six months as Rosenbaum Fellow at the Newton Institute in Cambridge, UK, when he was involved in the proof of Fermat’s Last Theorem. 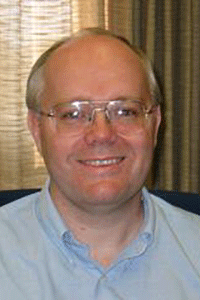 In later years he moved towards electrical engineering, joining the Coordinated Science Laboratory and Beckman Institute at UIUC and becoming in 1999 founding director of the Illinois Center for Cryptography and Information Protection. In 2002, he was hired by the University of Wisconsin – Madison as part of its computational sciences cluster, with a split appointment in Mathematics and Electrical and Computer Engineering. He spent the 2006-7 academic year as Williams-Hedberg-Hedberg Chair at the University of South Carolina, and the 2008-9 academic year as Stokes Professor of Pure and Applied Algebra at University College Dublin, Ireland. He was founding director of the UW WiSeNet (Wireless and Sensor Networks) Consortium, maintains affiliation to UIUC and UCD, and divides his time at UW evenly between algebra related to the proof of FLT and applications of algebra to engineering and computer science.